Think back the last time you were preparing for a trip. You probably searched for places to stay, looked at various restaurants to dine at, and picked out activities to do while you visit. Now, think about the resources you used while you did the planning. Most likely, you read a few online reviews during this process. Online reviews are one of the main resources used to make a decision about whether or not to do business with a company. We do this when we’re looking to buy a new laptop on Amazon, when we’re on Fandango looking for the right movie to go see, and when searching for the best cappuccino in town. Reviews provide candid feedback to your company, which helps identify where improvements are needed. They create a conversation online about your business and give you credibility. Also, internet reviews impact your ranking in search engines. So, how do you go about attaining more reviews for your business? Implementing a review acquisition strategy will help maximize the number of reviews you receive online. A strategy comprises of knowing when, where, and how to ask for reviews. It shouldn’t take up too much time and it will have a positive effect on your business. Here are 5 guidelines to consider when building your review acquisition strategy. If a customer has to create a profile on a specific site because that’s the only place you’re featured, they most likely won’t go through with it. Meet them where they are! People have preferences about most things in life, including where they read and write reviews. Having a filled-out profile on multiple review platforms will increase your exposure and make the review process easier for customers. Understanding the policies of a review page will help with maintaining your profile and keep you from being penalized. You may end up losing reviews if you don’t educate yourself on the policies. We don’t want that now do we? Easy enough, right? Let your customers know that you’d love for them to write a review. Since you haven’t asked, they may not be aware you need reviews. Just remember, some review pages have created policies against linking their site (see point #2). Please note: Never tell a customer to write a “good” review for you. Rather, ask for them to share their experience and give you honest feedback. When you send an email or invoice. When they have contacted you with positive feedback about your services. 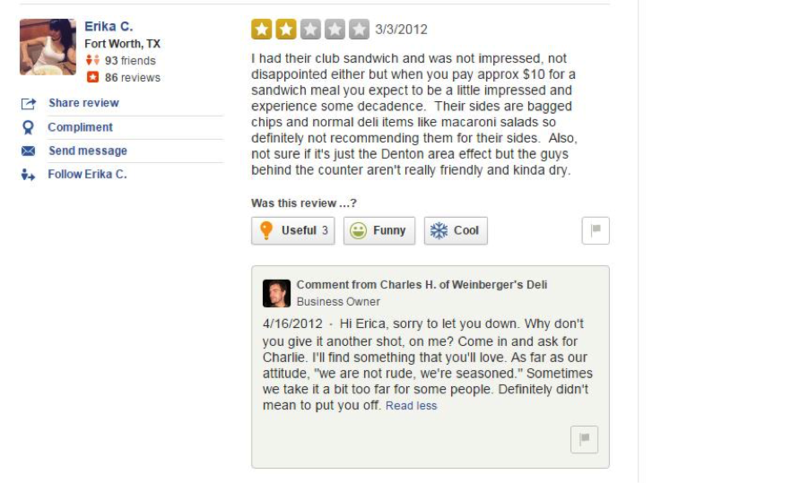 Bad reviews are no fun! As much as you may want to debate with the customer who dragged your business’s name through the dirt, it will not help your case. It may help you to treat the review as if the customer had told you this in person and not online. An apology for the negative experience they had with your business. A “thank you” for sharing their insight. A solution to the problem they had with your business. An invitation for them to give your business another chance. Do everything you can to express your care by attempting to remedy the situation. This creates an opportunity for you to build a better relationship with the customer. Here the business owner took the appropriate action following the simple steps listed above to respond to his negative review. Backing it up with data! A survey by BrightLocal indicated that about 85% of consumers reported reading online reviews. Dimensional Research concluded that positive online reviews impacted the buying choices 90% of respondents, and 86% were swayed by negative online reviews. The MOZ Local Search Ranking Factors Survey, determined online reviews are thought to make up 10% of how Google and other search engines decide to rank search results. As you can see, reviews are kind of a big deal! There you have it! The more reviews, the better for your business! Now that you’ve got an idea of how to build a review strategy, hopefully, you will see your review pages blow up with comments! Interested in more digital marketing tips and solutions to grow your online presence? Contact us today to start your project!